Kansas offers the Learning Quest 529 Education Savings Plans, which are managed by American Century Investments. Learning Quest offers education savings accounts to help you pay education expenses for individuals that you designate, or for yourself. The program provides tax advantages under both Kansas and Federal law. Kansas taxpayers may take an annual deduction of up to $3,000 ($6,000 for married, filing jointly) from Kansas adjusted gross income for contributions into each beneficiary’s account. Kansas also offers the Learning Quest Advisor and the Schwab 529 Plan, which are managed by American Century Investments and distributed by Charles Schwab & Co., Inc.
Kansas living with a disability are now able to save for the future, just like any other Kansan. Under the ABLE Savings Programs, these individuals now have the option to open a checking account with a debit card to use for living expenses such as education, medical, and housing without affecting their disability benefits. Under the ABLE Savings Program, Kansans with disabilities are able to choose between six different, tax-advantaged investment options since January of 2017. The program also offers a new banking product similar in the form of a checking account. Kansas is currently holding over $350 million belonging to Kansans. The Unclaimed Property Division seeks to return various forms of unclaimed property to the rightful owner or heirs. Each year thousands of people lose track of their bank accounts, cash, stocks, bonds, refunds, royalties, safe deposit boxes and other property. People move and forget to furnish their bank, broker, employer or insurance company with a forwarding address. Losing sight of property can happen to anyone. It is the Treasurer's job to reunite rightful owners and heirs with unclaimed assets currently being held by the State of Kansas. 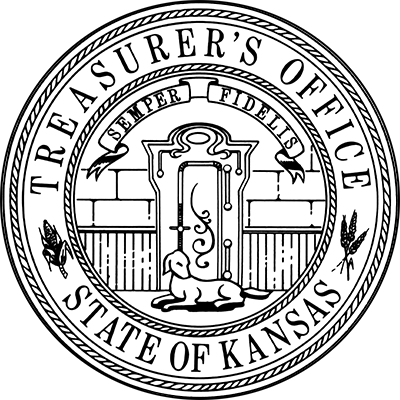 The State Treasurer was designated as the fiscal agent for the State of Kansas in 1908. The registration of the issuance of municipal bonds was transferred to the State Treasurer in 1975. As a consequence of legislation in the 1980s, the State Treasurer has become registrar and transfer agent for those Kansas registered form municipal bonds that designate the Treasurer as paying agent. The office services more than 2,200 issues totaling in excess of $13 billion. The Cash Management Services Division is charged with receipt and deposit responsibilities, as well as those relating to payment of warrants. The State Treasurer is entrusted with the possession of all public moneys paid to the state treasury. The Treasurer deposits moneys in Kansas banks designated as state depositories. The State Moneys Law, K.S.A. 75-4201 et seq., regulates the designation of banks that receive state accounts, the pledging of securities by these banks and the rate of interest to be paid on deposits of state moneys. "Jake LaTurner has been highly regarded as an ideas-driven leader throughout his time in Kansas Government. As the youngest statewide officeholder in the nation, Jake hopes to help raise awareness for the programs provided by the State Treasurer’s Office. He wants to help Kansans plan and prepare for the future." Learn more about Jake.